You've probably heard by now that Amazon Prime Day is upon us, and if not, boy do we have some great news for you: Prime Day is coming on Monday, July 16. You're going to be getting discounts all across the site, and since Amazon now owns Whole Foods, you'll be able to get some discounts there too. It's not going to be as simple as walking in and having avocados bestowed upon you for free, but there are definitely deals to be had. 1) First, if you spend $10 at Whole Foods as a Prime member between July 11 and July 17, Amazon will give you $10 in credit to use on Prime Day. When you check out, all you have to do is scan the Prime barcode on the Whole Foods or Amazon app. 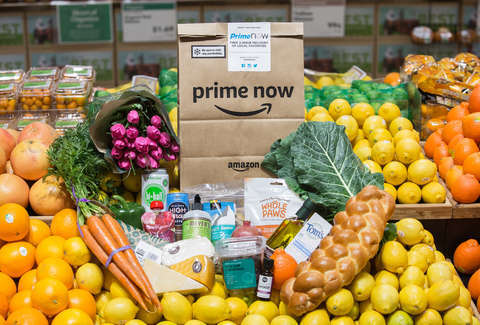 2) If you haven't lived your laziest life yet with Prime Now grocery delivery via Whole Foods, you can get $10 off if you order before July 17, and you'll get another $10 off another future order. 3) If you're an Amazon Prime Rewards Visa cardmember with a Prime members ship, you can get 10% back on up to $400 in purchases when shopping at Whole Foods between July 14 and July 17. 4) You'll have access to big discounts on Alexa products like the Echo and Fire TV in Whole Foods stores. And those are just the Whole Foods deals. Make sure to check back for the Prime Day deals.